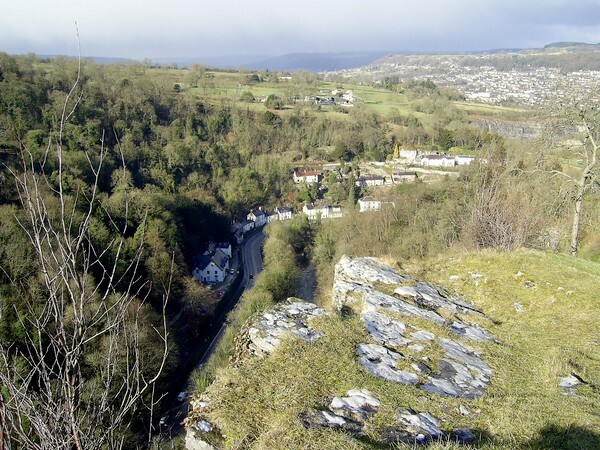 High Tor is a great limestone outcrop which towers almost 400 feet about the river Derwent between Matlock and Matlock Bath. The limestone was formed about 325 – 350 million years ago when the area was at the bottom of a shallow tropical sea. Over millions of years, limey muds and the shells and skeletons of tiny sea creatures settled on the bottom and formed a thick layer of limestone. Large areas of limestone such as High Tor have been pushed upwards by land movements and further shaped by glacial meltwaters at the end of the last ice age. You can walk up to the top of High Tor either from Starkholmes, or from the path alongside the River Derwent from Matlock. There are fine views down the Derwent Valley in both directions. You will find High Tor Grounds at the top, once a Victoria pleasure grounds laid out with romantic woodlands walks. These grounds offered an exciting ‘alpine’ route between the Victorian Spa resorts of Matlock and Matlock Bath.